Surrounded by metal the device has a rich MacBook feel to it, even the centre placement of a shiny mirror logo makes it look like a MacBook. Opening it up the felt like base around the keyboard tells me this is not just a normal MacBook Clone. The screen is beautiful, a large 3:2 aspect ratio screen that just screams take me seriously. 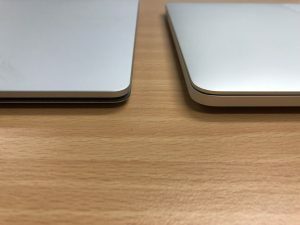 Looking at it from a normal distance I found it hard to determine a difference between the Surface and my MacBook. 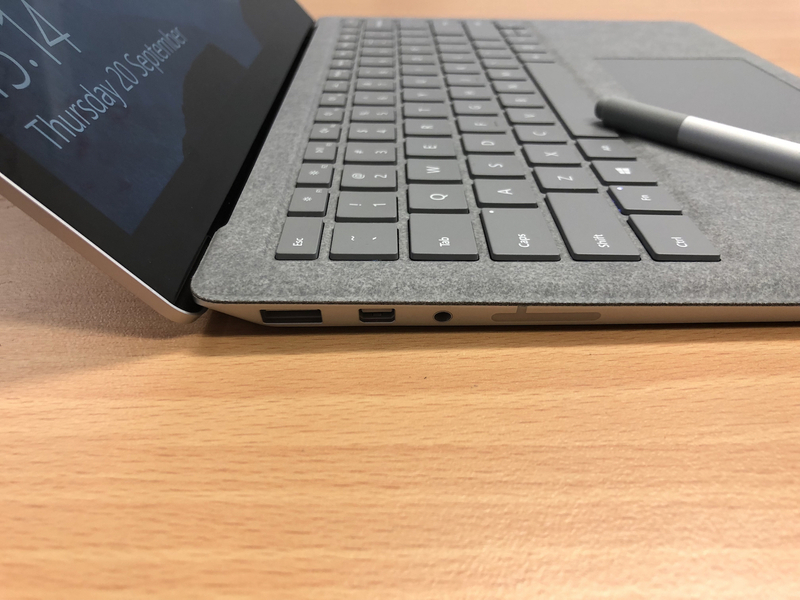 The Surface Laptop truly has the makings to be a great device. The Surface Laptop is part of Microsoft’s lineup of devices, and a line of devices that seat in a unique space. They scream ‘this is how a device should be’. Unlike other manufacturers, they don’t cover them in i5 or i7 stickers and stickers stating how great they are. There is a logo on the top and some manufacturing info underneath. 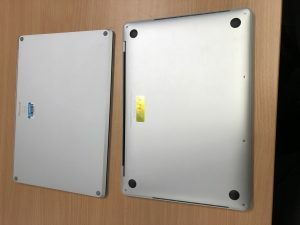 If you check out the MacBook Pro vs the Surface Laptop in terms labelling on their device Apple actually put more labels on, the moniker or ‘MacBook Pro’ at the bottom of the screen. You can infact see my MacBook Pro seating next to the Surface below. It is actually rather weird seeing them together, apart from the felt style cover around the keys and the trackpad they look very similar. You can see in the 3 photos below that the devices have almost the same Silver colour, the mirror style logo or Microsoft Flag or the Apple are the same (my Ubiquiti Sticker on my MacBook Pro is something I have obviously added). From the side the only real difference is that you can see the felt covering, and some different ports. 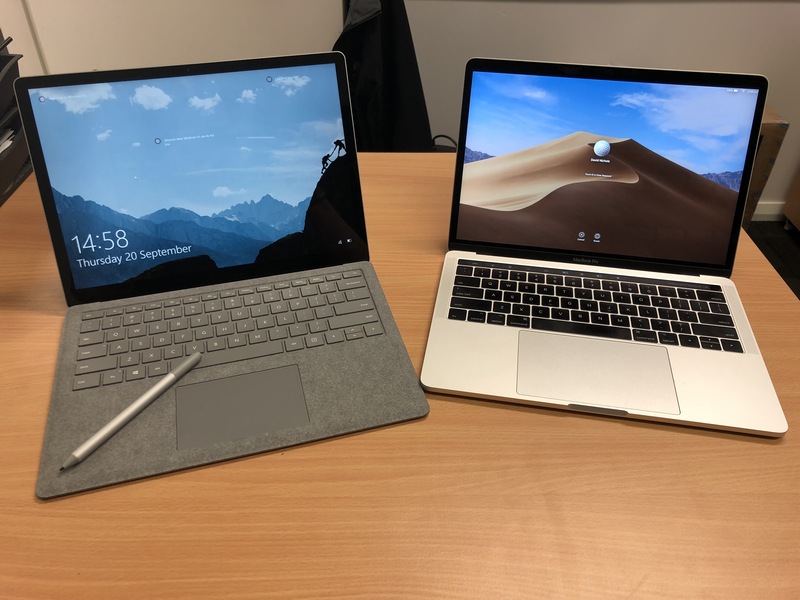 So why am I testing a Surface Laptop, well we needed to review devices for our students for next year. Year 3 and 7 are up for replacement and after many years of Dell, I wanted to make sure that the grass wasn’t greener on the other side. Personally, I am a fan of Apple Mac’s, my daily driver is a 2017 MacBook Pro with Touch Bar and I love using it. I am one of those strange people that actually love the feeling of the keyboard and will happening type for hours on end with it. So let’s start there. 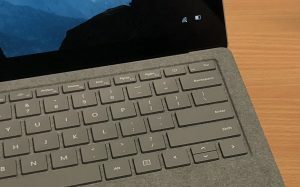 The keyboard on the Surface is good, better than most PC manufacturers devices that I generally use. But it isn’t amazing… to be honest, the one I am using is a little sluggish and I find I make typing mistakes as I go. I will admit that this could be because I am used to the lower profile keys on my MacBook Pro, but nevertheless, it is something I notice. One thing that I also really hate is the placement of the CTRL keys… please give me a left side CTRL key back. I am someone who loves pressing Shift+CTRL+Arrow to highlight half of my last sentence, and not having it there is just something that really bugs me. I know I can use key-mapping software to change the Right-Click button to a CTRL key. But On a windows machine, I actually like the right-click key. Also, I am not a fan of the placement of the power button, I understand why it is there, but it actually took me a minute to find it the first time I turned the device on. It should be easier to spot, and also not somewhere I could accidentally press. Other than that the keyboard is fine, but that is the issue it is just fine. Fine with a few issues and nothing special. Another notebook that has the island keys like so many others. Yes, they are back-lite, but that is more of a must-have feature these days, not something special. iPad keyboard cases have back-lighting these days. Let’s move onto the trackpad, it is pretty much the best trackpad that I have used… other than my MacBook Pro. It is good, but I would still feel that Apple has made a trackpad that so far no one has been able to live up to or beat. Let’s face it their trackpad is soo good their sell it separately, and I like many others have that as my main mouse. I do like how with Windows 1803 when you swipe up with three fingers you get a Mac style alignment of windows. Very copy copy like other parts of this notebook. Staying in that area let’s move onto the speakers, they are amazing. I can’t fault them for notebook speakers. Based under the keyboard they do better than most in creating a nice amount of sound out of nothing. Port-wise it is very limiting, 1x USB-3, 1x Mini-Display Port and a Headphone jack on the right-hand side, on the left I thought was a Card Reader is actually the charger. 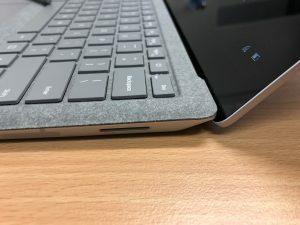 In 2018 I would really like to see a USB-C there which would also charge the device. I know Microsoft have their reasons for not using it but, as a consumer, I would rather have it than what seems like excuses. We now move onto the screen. Beautiful. As I said at the beginning their screens are a thing of beauty, with my eyes (which aren’t the best) I would rate it as on-par with my MacBook Pro’s screen. I also like the 3:2 aspect ratio, giving it more height than standard 1080p screens that feel like you are constantly scrolling. And having touch is something that in my head you never need but I keep going to use. Though I do have a theory on that, am I using it more because of a crappy trackpad over my Mac… hmm. You see my MacBook Pro trackpad is awesome, I said earlier I use even have an external one. And because it gives such an awesome user experience I wondering if I use the touch-screen here more because it gives a better preformance than the trackpad. The battery life is good, amazing even. When I was using it I often forgot that I was not charging the device, online people have claimed times above 14 hours, I never ran it that long but I feel the students would easily get a day out of the device. General Preformance, since I am looking for students to use I didn’t spend too much time on performance, for me I was more into looking at how the device ran doing simple tasks. Did it get hot or have any times it ran slow, most of the users of this will run a few applications at once, and some Year 7 students might put a game or two on it. Though I generally don’t need to make sure it can handle games other than somethigne like Minecraft which this can. Operating System… I know I can run Ubuntu on it, or any of the many other UNIX operating systems out there. And I could potentially even Hackintosh it to get macOS Mojave. But I am running Windows 10 on it, I instantly upgraded it past Windows 10 S. And for most people, it will be great, Windows 10 is getting better and better with each update. But I just prefer how Mac’s work. So yes the OS is good. But not for me. 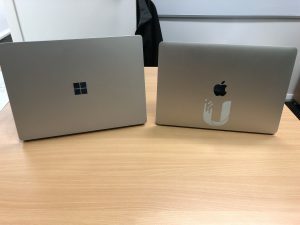 Conclusion, I won’t be swapping my MacBook Pro for a Surface Laptop, thought that is because I am an Apple fanboy. But I do see this as an amazing device, and its price and support from Microsoft are top notch. And I think I will be highly recommending it as a device we get for our next units. 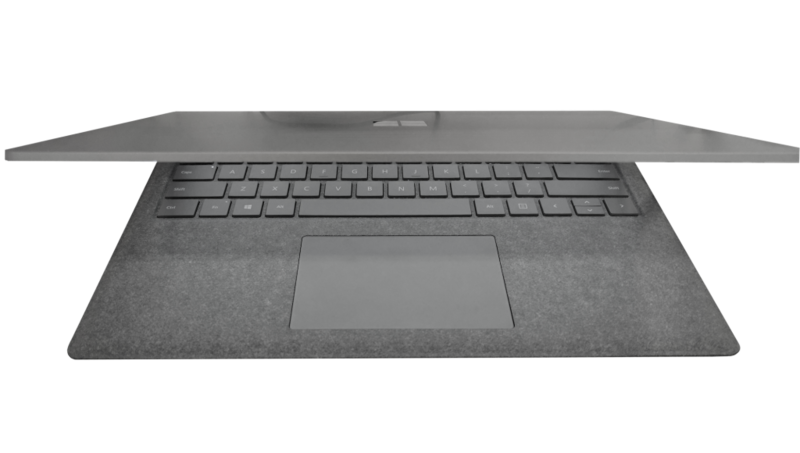 I would love to see USB-C on it, and I would love to see a better feeling keyboard and trackpad. 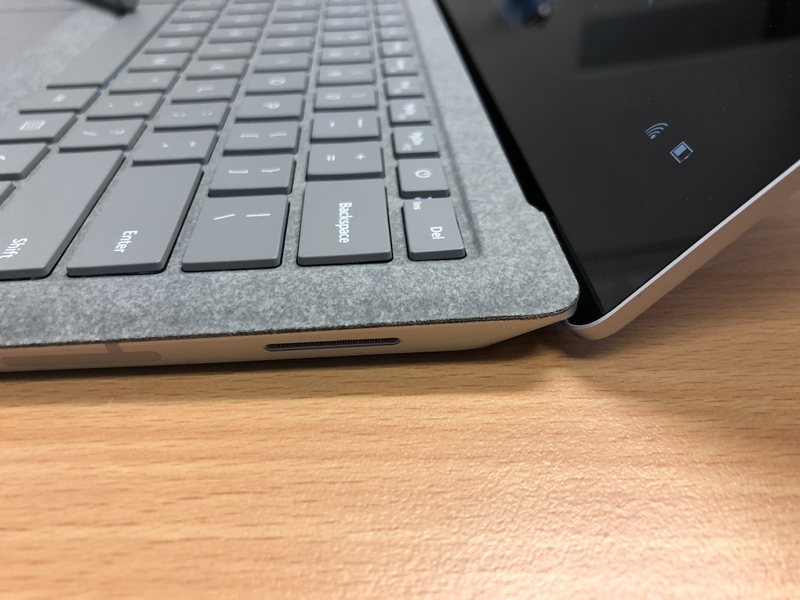 But for me, this is one of those devices that really make me question why I should go with a PC manufacturer when Microsoft seems to be making devices perfectly suited to their OS. So I would give is a 7 out of 10. But I reach for my MacBook Pro now that this review is done. Previous: Previous post: 40HD Independent wireless streams in one building… a world first?